We're not endorsing any big bets, of course, but a pair of London mathematicians say they're confident Spain will win the World Cup final Sunday. It's not just a prediction -- it's science. Queen Mary, University of London professors -- and soccer fans -- Javier López Peña and Hugo Touchette collected ball-passing data from each World Cup team and used graph theory to analyze each team's style of play. Their results reveal "gaping holes" in England's strategy against Germany, which they say explains team England's loss. The results also show that Spain's propensity for passing might help them beat the Dutch this weekend. 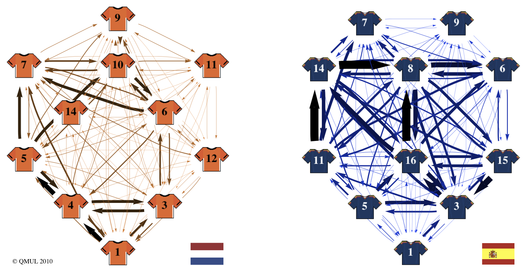 Touchette explains in a university press release that the researchers devised a network of passes among each player. Each player gets a score called centrality, which measures how important he is to the network; the higher the centrality score, the bigger the impact if he can't play. Regrettably, the team did not elaborate on Thomas Müller's centrality score.